Vologodskoe is a special kind of delicacy butter named after the ancient northern city of Vologda, where it is produced. 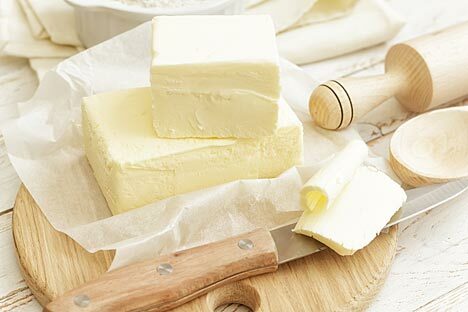 It is no exaggeration to say that Vologodskoe butter is known around the world. In the 19th century, it was delivered to England by sea and was also imported into France, a country known for its tough attitude towards foreign foods. Vologodskoe butter owes its fame to its strict control over production that has been carried out consistently during the entire century and a half of its history. Historically, dairy products produced in the Vologda region have been famous for their taste and high-fat content. The local water meadows, where the cattle graze, are considered the best in the country because of the soft misty summer, favorable for the growth of forage plants. There is also a technological secret – butter is produced from cream subjected to a special heat treatment, which gives it an exquisite walnut flavor. Similar natural conditions and the breed of dairy cows are also found in the regions neighboring Vologda – Novgorod and Kostroma, but their products, often no worse in quality, do not enjoy such fame and brand recognition. To make a legendary creation, there must be a master and an enthusiast. Vologda butter has such a person. Nikolay Vasilyevich Vereshchagin came from a prominent family; his younger brother Vasily is still considered the best Russian painter of battle scenes. In 1861, Nikolay returned to his home estate, which was experiencing economic difficulties because of the liberation of peasants from serfdom, and he decided to turn things around, and at the same time, help former serfs live economically secure lives. This process took a decade and a half. The young lord developed cooperative dairies after the Swiss model, improved local livestock, went abroad to study food production technologies, and engaged himself in social activities. Vereshchagin invented the recipe for Vologodskoye Butter after his visit to the World Exhibition in Paris, based on the example of the so-called “Norman butter.” Its secret, however, was not disclosed to the inquisitive Russian, so the mode of prior heat treatment of the cream, before churning, is his own invention. Over time, Vereshchagin’s business evolved into a vast industry and even a science. The dairy cooperative, which was opened near Vologda in the 1870s, was turned into the Dairy Institute in 1911, and in Soviet times, it was transformed into the Vereshchagin Dairy Academy, named after its creator. Now, this institution, considered the oldest university in the European North of Russia, is engaged in applied research and training of specialists in agriculture and food industry. At the turn of the 20th century, when Russia was switching to capitalism, Vereshchagin’s work was almost destroyed – products under the brand name of Vologodskoe Butter were produced in other regions. Vologda producers appealed to the courts, but the cases dragged on for years, until finally in 2010, the government intervened. It was decided to transfer the rights to use the trade designations to the region, rather than to any one company, which has no legal precedent in Russia. Only that butter, which has been produced according to certain standards in the region, can be called Vologodskoe. Only one thing can be said about its properties – the product has no varieties, the very name Vologodskoe indicates the highest quality and freshness. Only after a certain period of time it loses its honorary title, it is repacked from its branded packaging (beautiful wooden barrels one kilogram in weight), and is sold as extra quality butter.